Mathematics has been showing up in the news a lot more than usual lately. It has shown up in Slate, The New York Times, and The New Yorker and each time it has been accompanied by one other word, gerrymandering. 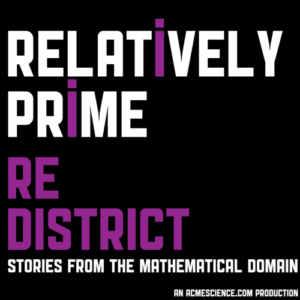 While Relatively Prime has covered gerrymandering once before in the season 2 episode Mathematistan(a story we just rereleased as an encore presentation in the feed so y’all can get a refresher on the mathematics of gerrymandering) so many important new things have been happening recently it seemed very important to talk about it again. The first interview in this episode is with Eric McGhee, a research fellow at the Public Policy Institute of California, who developed a new test for gerrymandering called the Efficiency Gap which takes into account wasted votes. Eric’s work on the Efficiency Gap with his research partner Nicholas Stephanopoulos was integral to the argument in Gail v. Whitford the Wisconsin gerrymandering case going before the Supreme Court this October. Samuel is then joined by Moon Duchin, a mathematics professor at Tufts University. Moon is the head of the new Metric Geometry and Gerrymandering Group. They are all about intersection of mathematics, technology, and redistricting. One of their big focuses is a series of conferences, the first one in Boston just recently took place, where they have a couple of days of public lectures and panels and then private workshops where they train PhDs to be expert redistricting witnesses and consultants, provide mathematical educators with tools to integrate gerrymandering into their curriculums, and hold a hackathon to develop tools for analyzing redistricting plans. Future conferences are coming up in WIsconsin, North Carolina, and Texas.